L.A. the Blog: Art Roundup In Hollywood and West L.A. The past few weeks we have been lucky enough to visit various spaces that have dedicated themselves to supporting local visual artists, displaying their artwork from floor to ceiling, though unfortunately for sale – it would be nice if we could find free art once in a while that we could take home (Annie Preece do you hear me, we want free art!). In utter wonderment, showing up at one coffee shop and one art gallery, not expecting the visually captivating paintings and collages at both locations, the artwork was totally engrossing and pleasantly surprising. 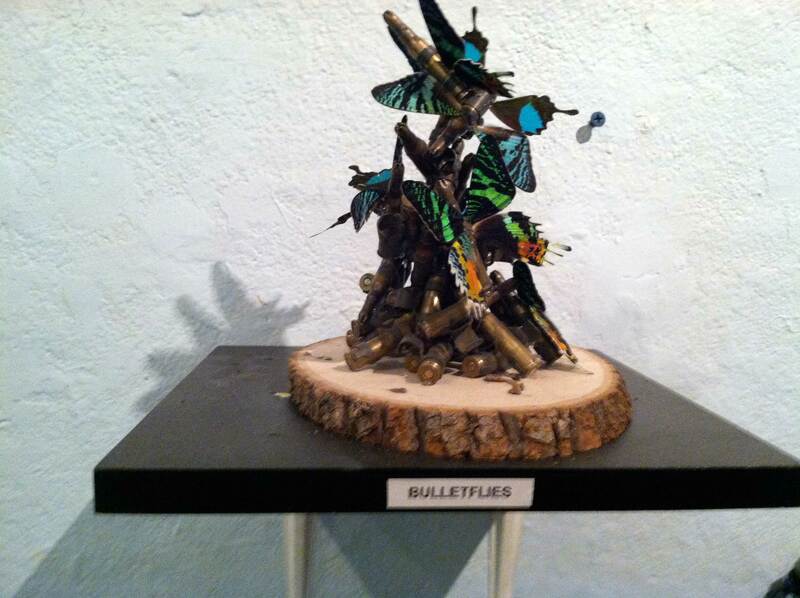 Artist Bella Bronson Fay recreates the iconic image of butterflies and bullets in the sculpture “Bulletflies” – 2012, Cacao Coffee Shop, West Los Angeles. First up hiding in Cacao, a small coffee shop in West Los Angeles that always showcases various artists, Bella Bronson Fay took over with sculptures, paintings and collages of sheer fun in a backdrop of modern dilemmas. Or should we say modern dilemmas in a backdrop of sheer fun? No matter each work captured the theme of innocence lost, as iconic images mixed with the hard realities of life. Drugs and candy, guns and flowers, scorpions playing with small robots, the juxtapositions gave meaning to images easily glossed over as kitsch. In the elegant fun of bright colors and plastic gloss the show answers the question of what happens in Los Angeles with its endless sunshine, wealth and extreme violence when you come out the other side of this contradiction. All that and it teases out a smile of hope. It is worth to note that imagery of Rave culture permeates Fay’s show. From the “rave candy” decorating a bra to a stereo in between two robots finding love, and of course all the flowers, the inspiration from the ever-thriving underground electronic music scene makes her work unique in its effort to capture the aesthetic of psychedelia mixed with techno-driven hardness all under the banner of peace, love, unity and respect. We won’t vouch for how long the show will last, but if you can make it to Cacao we are sure you will find art to capture the imagination. Then the next week just when we thought Friday night would end a boring disaster with nothing to stimulate us visually but bland streetlights and headlights seen through a very dirty windshield, L.A. the Blog got word of La Luz de Jesus Gallery in Los Feliz opening a new show. Three featured artists, multiple walls, two rooms and a hallway of fantastic art from previous shows made staring the grandest adventure, ever. 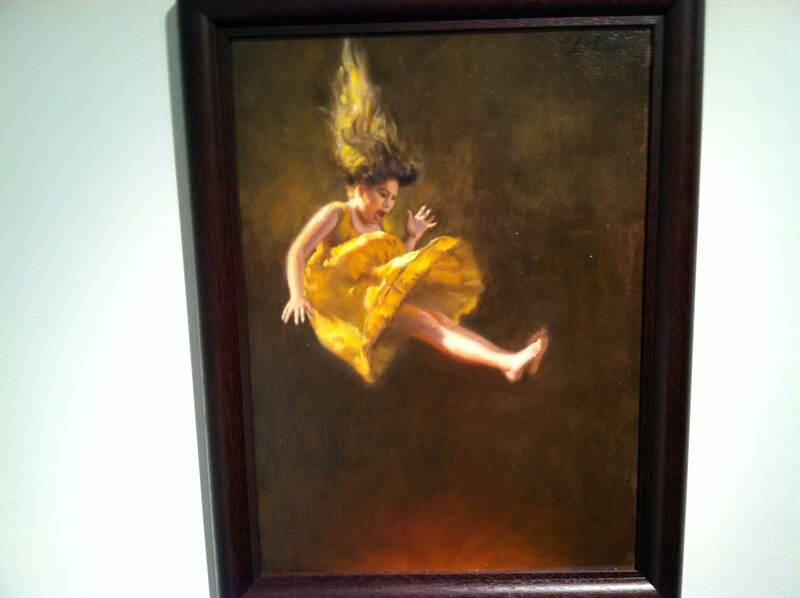 Dave Lebow’s depiction of the “Descent” into hell as innocence falls from grace. From the front gallery the wonderfully detailed images on the found canvases of matchbooks that Jason D’Aquino presented in a series of multi-media presentations and the colorful work of the artist known only as GERMS coalesced the reverent with the irreverent equaling the sum of all parts in Dave Lebows “End of Time Visions” that filled the entire back gallery. Whether you feel drawn to the combustible imagery reminiscent of Hollywood stars and starlets, or seek rather the mysticism of the inwardly searching found in the vivid color of life, nothing disappoints in the well-crafted work. If neither of these first two interest you, then you still have Lebow as he explores “death, vanity, monsters, demons and angels, Rapture, and falling from grace” in biblical revelations and religious themes that evoke enough sincerity to give any Catholic enough reason to repair to confession. D’Aquino describes his work in terms of the miniscule, who as a miniaturist meticulously details graphite renderings with white hi-lights introduced with a single hair brush. Yes, painstaking and amazing. At first look the vintage matchbooks seem art enough framed, hanging approachable and nostalgic only to have his various drawing intertwined with the matches to create an intriguing deeper look into various noir themes or other vintage cultural iconography. Included along with his matchbook series, other works capturing the shocking brutality of slang words and the abuse of power. Visually evident is the hours of time spent making the art impressive. La Luz gallery wall featuring artist GERMS. Jaime Zacarias, better known as GERMS had the least work showing in the gallery but his vibrant use of colors added much to the gallery in terms of abstraction breaking up the other two artists who pulled more on recognizable subject matter. In bright yellows, pinks and blues that dominate popular murals around Los Angeles the artist created an homage to the fantastic and mystic in a beautiful mash-up of shapes, lines and spirituality. Mas Puto indeed my friend, Mas Puto indeed! Finally Dave Lebow, a well-established artist in his own right gave the Palme d’Or presentation of the Devil and God waging fierce contest over the souls of the gallery viewers – or at least over our souls for sure. Inspired by commissioned artwork from last year that portrayed “Doomsday” the show prologued the moments leading up to an epoch of naked women with devils burning Los Angeles to the ground. All done in oil on canvas. Angels succumbing to the underworld, innocence descending into hell, and of course the Devil himself in a Johnny Cash revival of the “ring of fire.” While much of the artwork exorcised taboo ideas in regal fashion, a few of the works captured the haunting beauty and sadness that loss and redemption means. A favorite of the Blog as we are still seeking redemption for our irreverent ways. Below please find a slideshow of all the artwork we could capture during the past few weeks on our mobile-ready camera. Cacao is located at 1609 Santa Monica Blvd, Los Angeles, CA 90025, and Bella Bronson’s artwork ranges from the $100 to $300 range. La Luz de Jesus Gallery is located at 4633 Hollywood Blvd, Los Angeles, CA 90027 in the back of Wacko Soap Plant (and bookstore). 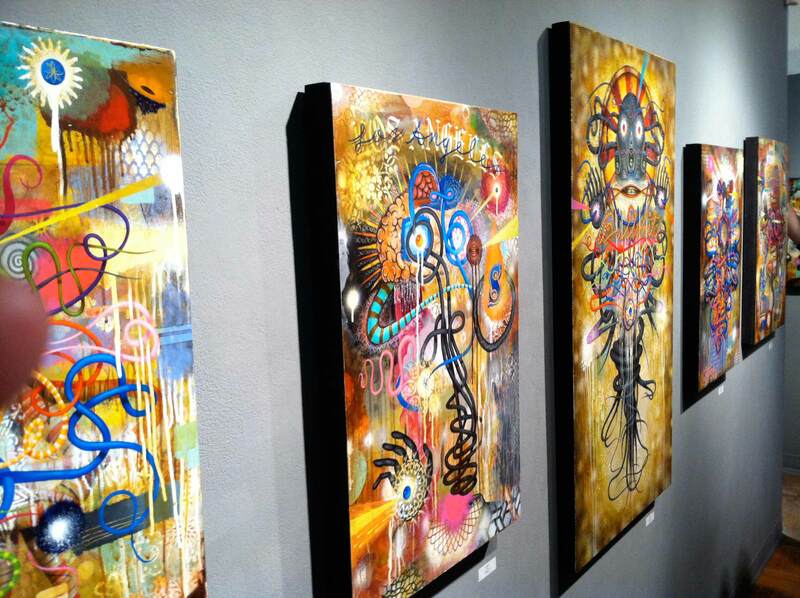 Artwork in the gallery ranged from $1,000 and up. This entry was posted in Art, Hollywood, L.A., LA, Los Angeles, Los Feliz, LosAngeles, Painting, Santa Monica, West Los Angeles and tagged art, artwork, Bella Bronson Fay, bible, Cacao, Cacao coffe shop, collage, Dave Lebow, GERMS, Jason D'Aquino, L.A. the Blog, La Luz de Jesus Gallery, noir, painting, rave, religion, revelation, sculpture, techno, visual artwork. Bookmark the permalink.